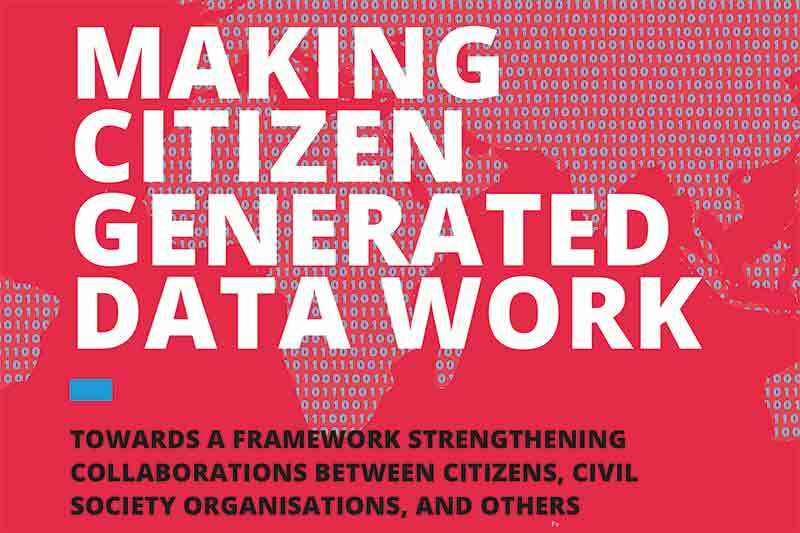 In late December last year, the Open Knowledge International (OKI) released a report on ‘Making Citizen-Generated Data Work’. OKI is a worldwide non-profit network promoting ‘openness, using advocacy, technology and training to unlock information and enable people to work with it to create and share knowledge’. OKI provides formal and informal guidance in this area to numerous governments around the world. The report starts off by highlighting that monitoring progress on the United Nation&apos;s Sustainable Development Goals (SDGs) cannot be borne only by national governments and National Statistics Offices. It is a matter of funding, availability of resources and conscious or unconscious bias. Citizen-generated data (CGD) can play a crucial role here. The report states that projects reliant on CGD depend on support from civil society organisations, community-based organisations, governments and businesses and collaboration between all these stakeholders. A 2×2 matrix is presented for classifying CGD projects. The governance axis is based on whether the context is characterised by strong or weak governance, which is determined based on issues such as the availability of information to make decisions, the strength of laws, the level of government responsiveness, the level of trust, and the level of informality around the particular topic. This is dependent on the specifics of the project, so that there can be a weak governance context within a strong state and vice versa. The linkage to government is based on whether the project is directly or indirectly to the government. It is influenced by whether a project aims to be complementary to government monitoring strategies, contribute to government processes and monitor performance of government, or whether the issue is being dealt with by outside of government players. Strong governance context, Direct link to government: In these instances, the CGD projects are targeted to be integrated into government processes. Government officials are directly engaged and are the primary users of the data generated. The projects in this category benefit from benefit from existing regulatory frameworks and established government processes. The projects are usually long-term because of political buy-in and they transfer knowledge to government, building capacity within government to independently perform or replicate the projects. Governments are required to invest, either in the form of training staff members, project funding, or technology. Strong governance context, Indirect link to government: In these instances, a great amount of information might already be available officially and the projects aim to fill possible data gaps. They leverage economies of scale to collect CGD. These are subject to the network effect. The more people actively participate, the more valuable and worthwhile it becomes for the entire network of citizens to participate and share information. As more information is shared by greater numbers, the more granular data can be captured and used for analyses of the issues the platform addresses. The successful project platforms in this category ensure their data is reliable through methodological rigour, so that they can position themselves as trusted sources of information. Hence, financial costs associated with the development of the platform present the primary barrier. However, the platforms can be monetised at a later stage. Weak governance context, Indirect link to government: Here, the projects act as intermediaries between governments, businesses and civil society. Leveraging existing resources, such as mobile phones, infrastructure is built to connect individuals or communities to each other and enable them to exchange information. They often involve the delivery of commissioned research to clients/ decision-makers helping them access data from remote areas. Projects are usually short-term and meant to address the immediate strategic and policy needs of government policy-makers, international NGOs or business. Weak governance context, Direct link to government: The context is characterised by a lack of information flows and organisational processes put into place to capture information. The goal is to improve government processes. An example given is Mobile Birth Registration, a partnership between UNICEF, the Government of Tanzania, the mobile phone operator Tigo and VSO International, which aims t simplify birth registration for children under age 5. Longevity of the projects is dependent on their ultimate incorporation into government processes. The report goes on to propose incentives which can be effective across different categories of projects in the context of the following. Engaging citizens to produce data: This involves providing a clear answer to the question: ‘What does the person get in exchange for contributing data?’ The definition of issues can be bottom-up, where citizens are already sensitised and need to bring in non-civic actors or top-down where citizens need to be made aware of the issues. Financial incentives for citizens: The report looks at three different scenarios, namely citizens being paid, citizens collecting data for free and citizens investing themselves to collect the data. It analyses the benefits and shortcomings of each and in what kind of scenarios each approach might work. For instance, where citizens are being paid, payments exceeding small cost compensations can be an obstacle to transferring problem-ownership to them and stopping payments. Aligning shared interests: This could be done by complementing existing work processes and organisational routines, use the same data to frame multiple issues and recognising and valuing different interests for data production and use by different actors along the chain of data exchanges. Flexibility as key for long term engagement: Focusing on the issues, rather than the technology, commitment to openness & transparency, and using interoperable formats so that data can be used for multiple purposes can help in enhancing flexibility.